Finding the right neighborhood and builder to meet your needs, budget, and preferences can be a very time consuming process. After much searching, driving through dozens of neighborhoods, and scouring the Internet for information, we discovered our "dream location" at one of Ryland Homes properties in our area. Our initial impression of the neighborhood was immediate and overwhelmingly positive. The people in the neighborhood waved as we drove by, and the houses were on spacious lots that had a classic American feel. 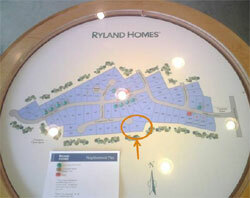 As with most builders, Ryland Homes had a sales office on site with several model homes to preview. Our salesperson was exceptional and we immediately liked her and to this day we call her a friend. However, business is business. Before we committed to building, we researched Ryland and found their reputation was stellar, their customer service top notch, and their building techniques were modern and world class. With these credentials and reputation, we felt confident enough to choose Ryland Homes over other builders, and our particular neighborhood for its style and location. In addition to our salesperson, we found Ryland's financing department to also be above exceptional. The staff was genuinely caring and we truly felt they had a heartfelt understanding of our needs. Though many people do choose to use third party financing for their mortgage, finding a builder with a good finance department can make not only getting a mortgage painless, but an all-in-one package that is easy to work with. It really doesn't matter where you live, you will always have neighbors you love and neighbors that have a number tendencies that you could do without. The best advice we could give you is to locate an area where people just like yourself live. If you are a blue collar, hard working family that comes into some money; you should really consider scaling back a bit. People that live in those huge homes come from a different culture and have a different set of values. Not to say that rich people are snobs, but you probably will be hard up to find somebody help you change your oil. It's a sad statement, but to some affect our income and tax brackets define us and our values. Try to locate an area where people have these same values and you will surely enjoy your stay. Another trick we found was using Google Maps and Google Earth to look at satellite views of the neighbors homes and surrounding area before even setting off to look at it. Guess how you can instantly discover if there are kids in the neighbor and what income level they are at? Look for pools. There are a lot of things that you should consider when choosing the right neighborhood to live in. In fact, this decision is as important as selecting the house itself. The neighborhood you choose should depend on whether you want to live in the city or in the country side. You should know that city life can be too busy and noisy. On the other hand, living in a country setting is peaceful and quiet, but sometimes lonely and boring. 1. Safety has to be the number one consideration. It would be best if you can do research on the present crime rate and incidence of robbery and mugging in that particular area. Have a tour of the area and check the streets to see if they appear to be clean. Another safety feature to consider is how well the neighborhood lit at night. You will be able to assess the safety of the place just by looking at the houses constructed therein. If you see broken windows or graffiti, you should think twice because that area may not be ideal for you and your family. 2. If you have kids, you should scout for schools and parks. In addition to this, you should take note of the type of transportation the area offers. For instance the school bus which your kids will ride on going to school and back. If the would-be house is near the school then that may be best because your children can just walk. If you would need before school and after school care, you should check into the programs the school or surrounding daycares have to offer. School activities and youth programs are also beneficial to help kids stay away from peer pressure and vices. 3. There should be a hospital, medical clinic and pharmacy in the area. For you to be able to know the route, you can check Google maps to help you out. The names of the doctors are usually posted on the internet. Take a drive to the hospital and check out whether their facility is conducive for patients. If you have a need for a specific type of specialist, you should make sure one is close enough to make it convenient for you or family members to get to. 4. The cost of living varies depending on the type of community you want to live in. Naturally, if it is an upper class type of neighborhood, you can expect that the costs would be quite high unlike when you decide to reside in a middle class neighborhood. The Chamber of Commerce in the area is a good source of data regarding business establishments, taxes and the average cost of living in the neighborhood. 5. The value of real estate properties fluctuates. Check whether there has been a significant change in the value of homes in the neighborhood. In addition to this, gather the data for the past 5 to 7 years regarding migration and the number of individuals who moved out of the vicinity during those years. If it is a good community, there should be a lower percentage of people who moved out. Other matters which you should know about the neighborhood are the presence of public vehicles such as trains, buses and cabs. The traffic can be unbearable especially during rush hour, so you should be aware of the traffic rules and the number of vehicles in the area. Restaurants and shopping centers are also a significant part of family life because this is where you bond with your kids. Who doesn't love shopping anyway? There are various types of information you can learn online. If you Google the place you want to live in, you can easily gather data regarding the neighborhood and the significant changes which happened in the past. Moreover, the Google map is also very helpful in locating various places like parks, malls, schools and business centers. Home construction is not that easy, more so if your project will be built in a different location. You should be certain that you are building in the neighborhood that is just right for you and your family.